I am sure all of us agree to the fact that seasonal eating is a very healthy habit. We are used to seasonal diets depending upon the availability of veggies and fruits during different parts of the year and usually prepare different platters during summer and in winter. I distinctly remember the first feel of summer with the pointed gourd (potol) curry with fish during my childhood and Luchi with green peas in the potato mishmash (alur torkari) for morning breakfast used to announce the winter in our platter. Due to scientific and technological advancements made by us, now we can have all kinds of vegetables and fruits all throughout the year. The essence of seasonal exclusivity has been somewhat lost. The eagerness of having the first cauliflower or small potatoes (notun aloo) during winter, or craving for the mangoes just as the summer sets in are beautiful memories that you always live with. As the winter is slowly setting in, I prepared a very colorful and tasty vegetarian dish. 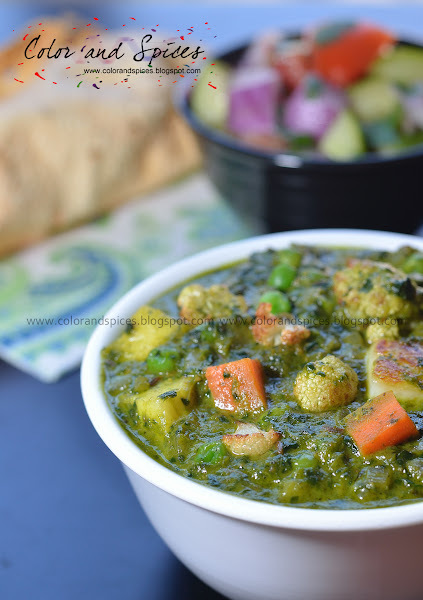 It has the goodness of spinach with other veggies and paneer. I learnt this delicious recipe from my culinary expert friend Jhum. A big thanks to her. Whenever I have prepared this dish, either for a party or for my family, everyone loved it. And for all the moms out there who are continuously looking for ways to feed more veggies to their kids, this one dish should be of help. So here comes veg-saagwala. 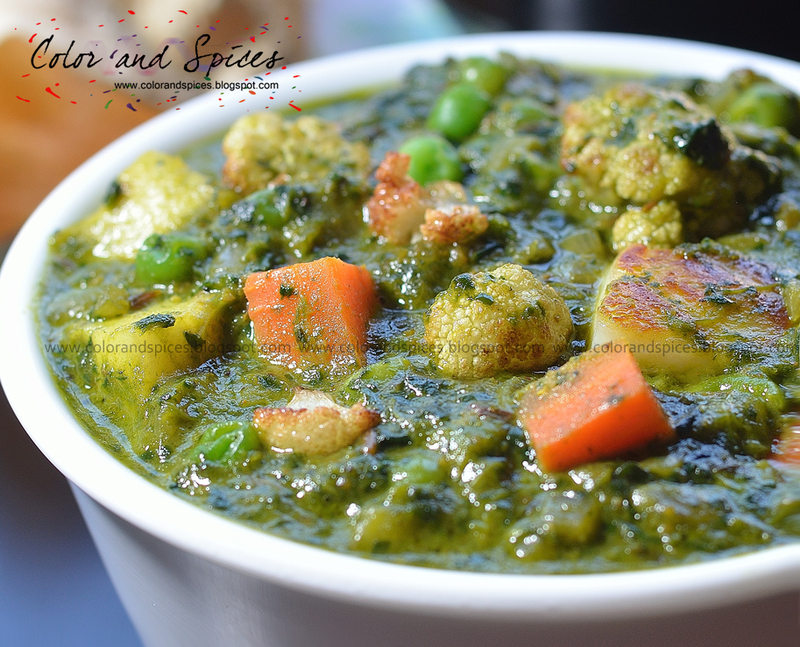 As the name suggests it has saag (spinach) and other vegetables. I also added paneer for extra taste and to add the protein quotient to the dish. 1. Wash the spinach very well. In a large pot boil water. When the water is rolling boil switch off the heat and put the spinach in the hot water. Cover and wait for 1-2 min. Drain out the water and wash the spinach with cold water. Chop the spinach and put it in a food processor to make a smooth paste. You can add green chilies while making the spinach paste. 2. In a pan or kadai add oil, any vegetable oil is good. 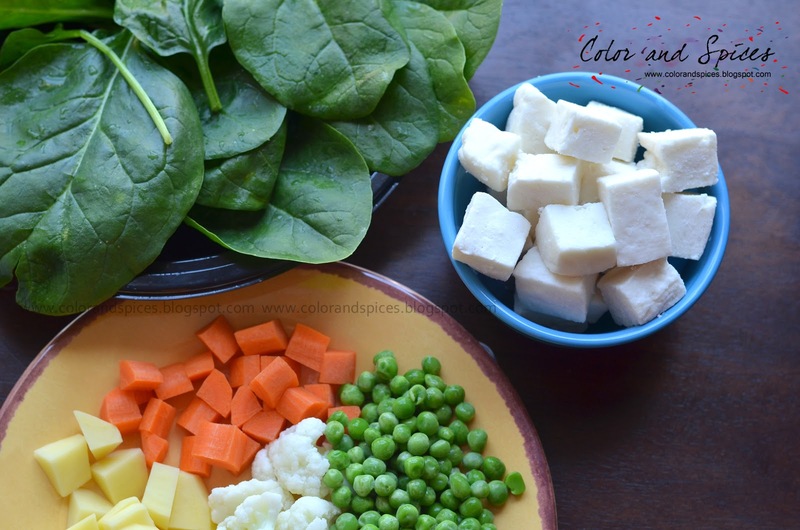 Fry the paneer cubes on high heat till the surface takes red-brown color. Keep them aside. 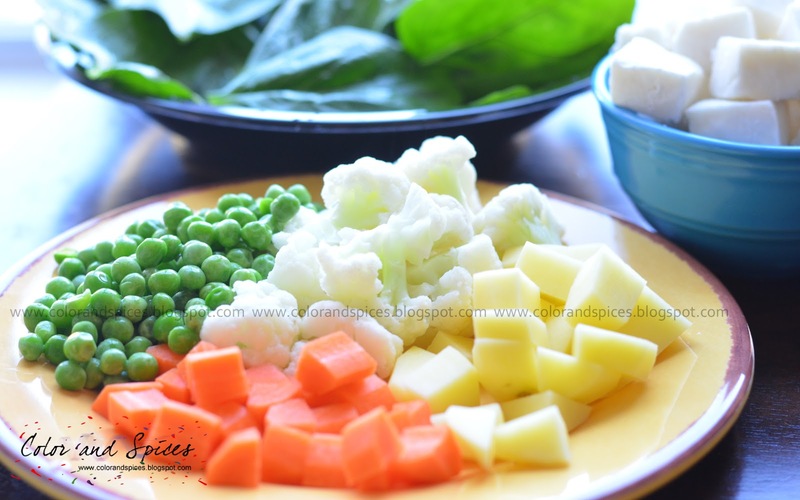 Fry the potato cubes, carrot cubes and cauliflower florets separately and keep aside. 3. In the same oil (if needed add more), add the finely chopped onions, cook on medium heat till the onions starts changing color to brown. Add the ginger paste, mix well. The original recipe suggested for garlic paste, but I did not use it, as I like this dish without garlic. If you want you can always add garlic paste at this stage. 4. Deseed the tomato and chop them fine. Add the tomatoes to the onion and sprinkle little salt. Cover and cook on medium heat till the tomatoes are done. 5. Add cumin powder, coriander powder, red chili powder, turmeric powder and mic well. Cook till oil separates. Add the spinach paste and cook on high heat. As the spinach paste boils reduce the heat and let it cook for 5-6 min and stir in between. 6. Add the fried vegetables, add salt and sugar according to your taste. Cover and cook on low-medium heat for 5 min. Add the paneer cubes and mix well. Cook for 2 min. Add crushed kasuri methi and garam masala powder, mix well. Add cream (if using) and mix well. Switch off heat. Transfer to a serving bowl. Add butter and serve hot with roti or paratha or any other bread.